Endeavour was launched into space today for the last time ever. Prayers don't shoot shuttles into space, though: Hurtling Endeavour and its crew 28 miles straight up were a pair of 1.3-million-pound reusable solid rockets. 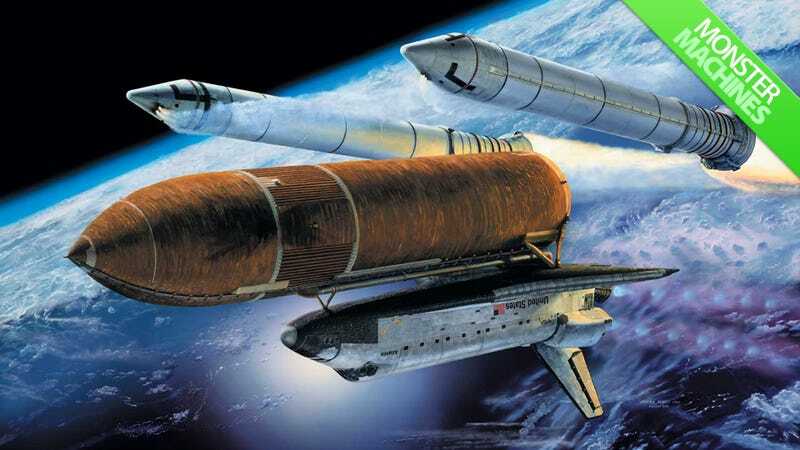 At its lightest, Space Shuttle Endeavour weighs 172,000 pounds with both of its rockets attached. But when Alliant Techsystems Inc.'s 126-feet long reusable solid rocket motors (RSRMs) are fully fueled, they weigh 1.3 million pounds. Each. And 1.1 million of those pounds are just the solid propellant. The propellant doesn't start out as a solid. Workers fill each of the motor's four segments with 40 seven-thousand-pound batches of liquid propellant. After a curing process that takes four days, the fuel solidifies, and the fully loaded motors are ready to produce a combined maximum thrust of 5.3 million pounds. Together, they boost the crew to an altitude of 24 nautical miles, all while making travel at 3,094mph look as effortless as a magic carpet ride (from my couch, anyway).